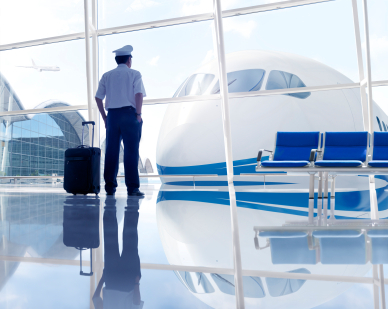 A career in aviation offers more than just financial rewards. Licensed commercial pilots get to see the world, while working in an exciting and challenging field. Students who are pursuing a career in aviation do so to satisfy long standing dreams of taking to the skies. It is not a career that people simply fall into, and students attending flight school have gotten there through a dogged determination to realize their professional ambitions. Like any highly trained professional, pilots require extensive education and training. Becoming a licensed pilot is expensive, and many students considering flight school will need some form of financial aid to complete their studies. At first glance, there may seem to be few financial aid options available for prospective pilots. But a closer examination reveals that there are more financing opportunities for flight school students than you may think. Commercial pilots working for a major airline can easily earn more than six-figures a year. It is an impressive income, but the salaries and benefits associated with aviation professionals reflect the challenges and responsibilities that go with the job. They also reflect the intense training and educational background needed to become a licensed pilot. Training to become a pilot is expensive, and the costs of flight school can easily top $50,000. Few students can afford to pay these costs out of pocket, and most will need to pursue some form of financial aid to make their education and training possible. Generally speaking, Federal financial aid should be every student’s first stop on the road to college funding. However, students pursuing careers as commercial pilots may find that their training programs do not meet the eligibility requirements for Federal financial assistance. This is because many flight schools are not accredited, and so do not fall under the U.S. Department of Education’s remit. For students attending an unaccredited flight school, private, or alternative, loans will be the major source of financial aid. Having said that, there are a number flight schools and colleges of aviation and aeronautics which are accredited, and that do participate in many of the Federal government’s financial aid programs. Students interested in pursuing a career in aviation may wish to limit their choice of flight schools to those that are accredited so that they may have access to the following Federal financial aid programs. The Federal Pell Grant – Unlike a student loan, money from a Pell grant does not have to be repaid. The Pell grant is awarded on the basis of financial need, and the maximum award amount is $5,500. Students attending a pilot training program at an accredited flight school may be eligible for the Pell Grant. Federal Direct Subsidized and Unsubsidized Loans – These low interest student loans are offered by the Federal government to help students find the money they need to complete their education. The Federal Direct Subsidized Loan is available to students who meet the requisite level of financial need. Qualifying students will have the interest on their loan paid by the government while they are enrolled in school. The Federal Direct Unsubsidized Loan does not require students to demonstrate financial need, and is available to all students enrolled in an accredited undergraduate or graduate program. Students receiving an Unsubsidized Loan will be responsible for all interest that accrues. Loan amounts for both the Federal Direct Subsidized and Unsubsidized Loans are determined by cost of attendance, less any other financial aid received. Students attending an accredited flight school should contact its financial aid officer to learn if they are eligible for these programs. The Federal Direct PLUS Loan for Parents – The Direct PLUS loan can be borrowed by the parent or legal guardian of a dependent child to help pay for their child’s education. Eligibility for the PLUS loan is determined by credit history, and loan amounts may not exceed the total cost of tuition less and other financial aid already received. These Federal financial aid programs are only available to students attending a participating accredited flight school or college of aeronautics. Students should contact the offices of admission for their school to learn if it is accredited, and if it participates in any of the government’s financial aid programs. Students pursing Federal financial aid will also need to fill out and submit the Free Application for Federal Student Aid to determine the level of financial assistance for which they are eligible. Once all Federal financial aid programs have been exhausted, or if Federal programs are unavailable, students will need to look for private student loans to help them pay their flight school tuition. Private, or alternative, loans are offered through banks, savings and loans, and private lending organizations. At this point students should understand that not all lenders offer loans for career training. While the majority of banks in the United States offer some type of student loan program, they are not always applicable to students enrolled in technical colleges or career trade schools. This is slowly beginning to change as more banks realize the value of helping students reach their career ambitions, and move into the general workforce. Students looking for loans for flight school will want to search for banks and lending companies that offer specific loans for trade schools or career training. The following are examples of private lenders who offer loans for students enrolled in specific career training programs at a technical college or trade school. Sallie Mae is one of the largest private lending institutions in the United States. They specialize in providing affordable loans for students of all types and backgrounds. Sallie Mae currently offers the Career Training Smart Option Student Loan for students enrolled in trade schools, technical schools and vocational colleges. Students enrolled in a pilot training program at a licensed flight school within the U.S. will be eligible for this loan. Borrowing limits are determined by the student’s total cost of tuition, and loans are approved on the basis of credit history. Wells Fargo offers a wide variety of student loans, including the Wells Fargo Student Loan for Career and Community College. This loan is applicable to students enrolled in pilot training programs at a recognized licensed flight school. Borrowing limits are determined by the total cost of tuition, and loans are approved on the basis of credit history. Students may choose from a fixed, or variable, interest rate and may defer repayment for up to six months following graduation. Private student loans make it possible for many students to achieve their educational and career goals. However, students should consider any loan agreement carefully. These are binding contracts, and many students have been undone by borrowing more than they need, or by signing loan agreements they did not fully understand. Students are advised to take their time, read all loan paperwork carefully, and ask for clarification on any details which remain unclear before signing any agreements. Many flight schools are prepared to work with students to help them secure the necessary financial assistance needed to complete their pilot training programs. A large number of flights schools, both accredited and non-accredited, have developed close working relationships with banks and other private lenders in order to make student loans more accessible. Students should contact their school’s financial aid offices for details on possible loan programs which may be available to them. The following examples of nationally recognized flight schools, and the financial aid programs they support, will give students an idea of what may be available to them. Airline Transport Professionals (ATP) is an industry leader in multi-engine pilot training. With nearly a dozen schools throughout the country, ATP offers the type of total immersion flight training that is highly sought after by commercial airlines. ATP works with a variety of private lenders, including Sallie Mae, SunTrust and the American Airlines Credit Union to provide affordable loans for students enrolled in one of their flight training programs. Application for all loans should be made through ATP’s dedicated website, or through the financial aid offices located on any one of their campuses. Aviator College of Aeronautical Science and Technology offers a wider range of financial aid opportunities for its enrolled students. Aviator College has partnered with PNC Education Loan Center to provide affordable career training loans for its enrolled students. Aviator College is also an accredit school, and attending students will have access to many of the Federal government’s financial aid programs including the Pell Grant and the Federal Direct Loan Program. Phoenix East Aviation has been training commercial ready pilots since 1972. With one of the highest hiring percentages of any flight school in the country, Phoenix East Aviation has built a solid reputation for graduating highly trained pilots who are prepared to transition directly into the commercial aviation workforce. Phoenix works closely with a number of private lenders, including Sallie Mae and Javelin to provide loans for students enrolled in one of their flight training programs. Never borrow more than is absolutely necessary to cover the costs of your tuition. Never sign a loan agreement if you have not read, or do not fully understand, the contract. Understand your rights and responsibilities as a borrower, as well as the rights and responsibilities of your lender. Never sign a loan agreement without a solid plan on how you will repay that loan. Students considering private lender loans for flight school should understand that default is not an option. Loans are binding agreements between you and your lender, and defaulting on that loan can have devastating consequences. If you feel you may be close to defaulting on your student loan contact your lender directly. In many cases they will work with borrowers to restructure their loan to make repayment more manageable. Students with multiple loans may need to consider private loan consolidation as a way to combine their outstanding loans into one, and to reduce their monthly payments. If you are having difficulties repaying your loan, contact your lender immediately and work with them to resolve the issue before your loan goes into default. The job outlook for commercial pilots continues to be positive. The need for new pilots is expected to increase by 11% in the next decade, and as older pilots begin to retire that number will rise. While many flight school graduates will plan to fill these positions, others may find that their paths lead to careers as cargo pilots, instructors, or working in aviation administration. A career in aviation is a challenging path to pursue, but it is one that offers excitement, travel and financial stability.